by Thomas Jay Kemp, NewsBank’s Director of Genealogy Products, used with permission. Today if we lose touch with a friend or relative we can go to the Internet and see if we can track them down on Google, Facebook or a networking site. That’s now—but what did people do before the Internet? How did people locate missing family, or find lost relatives? In earlier times, people would find lost family members by placing “missing family” or “lost relatives” advertisements in newspapers. With thousands of newspapers being published in the U.S. before World War II, individuals trying to find lost family members would strategize and select the newspapers that would most likely be read by their target person, or someone who knew him or her. These missing relatives and friends advertisements can be a gold mine for genealogists looking to fill holes in their family trees. They can be especially helpful with Irish American genealogy. Irish Americans living along the East Coast and up into Canada read the Irish World newspaper published in New York City. If you were an Irish American, then the Irish World was the newspaper you would use to get your message out. With a widespread Irish American readership hungry for news of the old country and interested in the successes and accomplishments of their fellow emigrants, these advertisements would be read with a spirit of sympathy for the circumstances faced by the advertising family, in hopes that the reader could be of help. Like a Facebook message ricocheting across the country at the click of a mouse, word would flash through this 1904 Irish American network that Edward Reilly of Butte, Montana—originally of Carrickallen, County Cavan, Ireland—was looking for his brother Patrick, a motorman in New York City that he had lost touch with five years earlier. Another approach people took to find missing persons was to advertise in job-related newspapers. Like emigration, the lure of the sea was another reason why people left an area and often lost contact with their family and friends. This is a typical “information wanted” advertisement inserted in the Honolulu newspaper Friend that was widely read by sailors and others involved in the maritime and naval shipping industry. The whereabouts of Charles Edwin Greene of New Bedford, Massachusetts, or Providence, Rhode Island, was requested by his mother. You immediately realize the mother’s anguish: her son had not been heard from directly for nearly four years. Newspapers are essential for genealogical research. Often we focus our research on local newspapers to find articles about our ancestors published in newspapers close to where they lived. In both of these examples, however, we see that families advertised in newspapers across the county, believing their missing family member or perhaps some friends were likely to be reading those papers and would see the ads. Bottom Line: Genealogists need to cast a wide net and search all newspapers for their ancestors. Don’t think your assumptions are correct, and narrow your search to only your ancestors’ local papers. If you get too many returns, you can limit your search by date range to restrict the number of search result hits you have to sift through. Just like obituaries and marriage announcements, advertisements can be critical to your research. One of the key sources for online newspapers is GenealogyBank.com. Featuring more than 5,700 U.S. newspapers with over 1 billion names from all 50 states, GenealogyBank is one of the most extensive online historical newspaper archives available anywhere, designed specifically for family history research. Over 95% of our newspaper content is exclusive to GenealogyBank. By providing access to rare and hard-to-find newspapers from 1690 to the present day, GenealogyBank gives researchers the opportunity to discover unique, long-forgotten information about their American ancestors. For a limited time, annual memberships are at their most affordable if you join before December 2, 2011. For a little more than $4.00 per month, you’ll save over 30% off an Annual Membership. The hottest new genealogy gadget is the Flip-Pal™ Mobile Scanner - now available from Legacy Family Tree. If you have been considering purchasing it or just want to know what all the hype is about, we invite you to attend our free webinar this Friday, December 2, where the CEO of Couragent, Gordon Nuttall, will show us how it all works. Take your Flip-Pal™ mobile scanner with you to scan those precious documents and photos that Aunt Betty won’t let leave her home. You will have your own digital copy to pass on your legacy. We will show you how to overcome research challenges using the Flip-Pal™ mobile scanner. Family historians and genealogists alike are often faced with challenges creating quality digital files of both documents and images. Challenges seem to appear at every turn... in an archive scanning fragile documents, or on a once-in-a-lifetime trip exploring family roots. Scanning documents is an essential part of gathering and sharing genealogy records. Conventional scanners require long hours at your computer, can't scan documents that are at a remote location, are fixed in size, and can damage the original fragile document. In this webinar, we'll show how to use the Flip-Pal™ mobile scanner to scan with high detail wherever the document is located, and with any size original. Learn why the Flip-Pal™ mobile scanner is a highly regarded genealogy research tool and is the only scanner permitted in the National Archives because it does not risk damaging the original. The live webinar is scheduled for Friday, December 2, 2011 at 2PM Eastern U.S., so register today to reserve your virtual seat. Registration is free but space is limited to the first 1,000 people to join that day. Gordon Nuttall is the CEO of Couragent. Gordon has founded three other small businesses and two non-profits. His previous successful innovations have been in digital cameras, desktop scanners, consumer products software, multi-function peripherals, fax, and personal mass storage. He has been granted four patents and has three patents pending. He founded Couragent as a values-based organization, with Courage, Integrity, Collaboration, Innovation, and Care as its foundation core values. 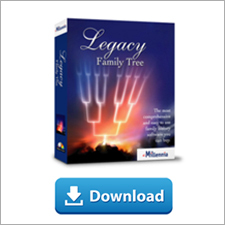 Just in time for the holidays - all Legacy Family Tree software is $10 off until December 31, 2011. Nearly every Legacy add-on, webinar CD, training video set, and how-to book has been discounted for this holiday sale, including Geoff Rasmussen's new book The Official Unofficial Guide to Using Legacy Family Tree and Paul Larsen's popular book, Crash Course in Family History. We've just added the Flip-Pal Mobile Scanner to our online store. This is the scanner that everyone has been talking about. Click here to view. According to the United States Postal Service (as of November 28, 2011), these are the "last mailing dates to arrive by Christmas." This past July, Google users from around the world began registering for a preview of the new Google+ service. It wasn’t long before the genealogical community led the charge to adopt this new set of powerful tools. Our August webinar on Google+ set records for registration and attendance as family historians and technologists from 72 countries heard Paul Allen, Dan Lynch, and Mark Olsen formally introduce The Google+ Project to the worldwide family history community. In fact, the event attracted viewers from outside the world of genealogy too! In this updated webinar, Dan Lynch will step us through a closer look at Google+ and we’ll see how he and others are putting various features of the service to use for individual family history work, but also for societies and other organizations. As author of the award-winning book, "Google Your Family Tree" - Dan continues to share the benefits of Google and other technology offerings with family historians from around the world. You won’t want to miss this event! The live webinar is scheduled for Wednesday, November 30, 2011 at 2PM Eastern U.S., so register today to reserve your virtual seat. Registration is free but space is limited to the first 1,000 people to join that day. It was bound to happen at some point, and it did, but it's ready to go now. Due to the joys and complexities of technology, Drusilla Pair's October 26 webinar didn't go as smoothly as planned. But thanks to "Professor Dru's" persistence, enthusiastic attitude, and a little post video editing, we are now able to announce the availability of her webinar's recording, CD, and handouts. In Let Your Voice Be Heard in the Digital Conversation, Drusilla taught why genealogists should use audio recordings to preserve our family history and explained which software and hardware were necessary. 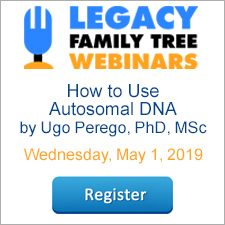 To view the 48-minute recording of Let Your Voice Be Heard in the Digital Conversation visit www.LegacyFamilyTree.com/webinars.asp. It will be available there at no cost until December 5, 2011. Own your own copy of Let Your Voice Be Heard in the Digital Conversation by purchasing the webinar-on-CD for just $9.95. It includes the 48 minute recording of the class, the complete Q/A session, and 4 pages of handouts. Click here for more information or to purchase. The Phoenix Family History Center is sponsoring a Legacy User Group starting December 13 at 7pm at the Center. This is for all users of the Legacy genealogy software to come together to learn how to get the most out of the software. This will be the first organizing meeting to discuss the dates, times, objectives and frequency of meetings. All those interested in Legacy genealogy software are invited to attend. Any questions please contact Gene Carruth, cell phone 602-370-0564. For a list of world-wide Legacy User Groups, visit http://www.legacyfamilytree.com/UsersGroups.asp.